Klewel 2.0 | How Triskel can help you in adding value to your events? Triskel is our main product. 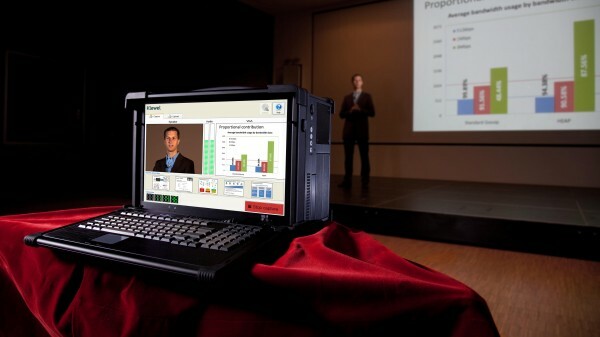 It is a comprehensive webcasting solution. We have been using it for the last five years. 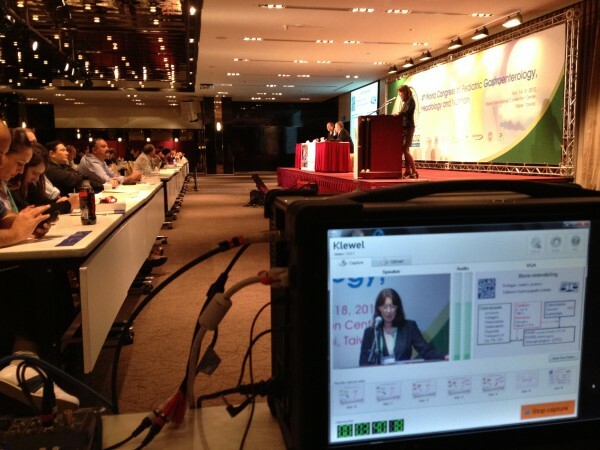 We have enhanced it year after year and we now allow third parties to make use of it and webcast their conferences. Why? Because we simply cannot go everywhere and because we are convinced that this solution can help audio visual companies to webcast events such as conferences, congresses, workshops. Here is more information about our product. Contact us for a quote. 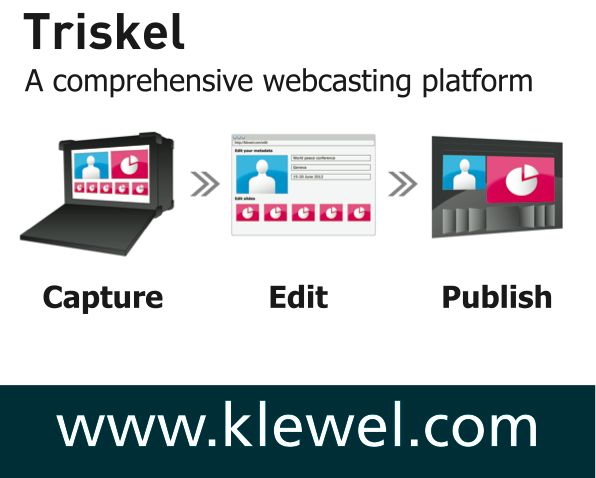 Klewel proposes a comprehensive webcasting solution, complete with an audio-visual recording station linked to a web platform that makes it possible to automatically reference, edit and publish content (audio, video, slide shows) in total simplicity. In addition, the content of each presented slide is also indexed. Each event is accessible anytime, anywhere (at home, at the office or elsewhere) and can be viewed on all types of media: computer, mobile phone, tablet, etc. By acquiring the Triskel capture station, you, as an audiovisual agencies, can rely on an efficient webcasting system, which is easy to use and in step with today’s market. The Triskel station is available as a portable computer or it may be delivered in a customised form to meet your needs. The event can be viewed shortly after it has finished. The slide show presented by each speaker accompanies the video ; synchronisation is guaranteed. The search engine can find a key moment in the presentation ; viewing of the entire event is not necessary. Identification of each speaker / affiliation / sponsor is optimal. Navigation is simple ; chaptering follows the slide show. Whether you ask us to record your events or do it yourself with the Klewel station, our webcasting solution is extremely simple to use. Only a basic knowledge of computers (and/or audiovisual wiring) is required. If you are interested in getting a demo and more information about Triskel, do not hesitate to contact us.